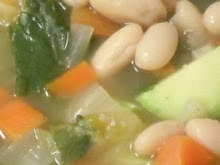 I am pleased to offer several workshops for guilds and groups. Photos show participant work from past classes. Those involving machine piecing require sewing machines. Each participant should have a design wall and access to a large cutting mat, rotary cutter and iron. Those involving hand stitching require nothing but scissors. Learn how to piece very fine lines, and make a small pieced top in which you use fine lines to fracture the surface. Explore different kinds of pieced lines (straight, curved, swoopy, etc.) and how to sew them. Experiment with using lines to "draw" shapes and designs, using lines to fracture the surface, and juxtaposing different densities of lines. After you find your favorite style of line work you'll make an original composition. Studio sessions will also involve group discussion and critiques. Use a concept -- the traditional rail fence block -- as the springboard to make a quilt, or a dozen, without a pattern, each one totally different. 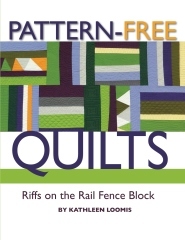 Consult the examples and suggestions from my book, "Pattern-Free Quilts: Riffs on the Rail Fence Block." Use a concept -- the traditional log cabin block -- as the springboard to make a quilt, or a dozen, without a pattern, each one totally different. Make several strip-pieced panels, then slice and reassemble them to make a quilt. Learn how to audition and refine a composition on the design wall and how to sew it together. Learn how to cut and stitch curves that fit together perfectly without a pattern, then make two small improvisational quilts using your new skill. Make a work of art out of your tiniest strips, bits and leftovers. Learn different design techniques for combining bits and pieces. Learn how to audition and refine a composition on the design wall and how to sew it together. Learn Kathy's secret method for improvisational cross stitch that looks complex and painterly but is really very simple to stitch. If you can thread a needle you can do this exciting and surprising embroidery method. $5 supply fee covers all materials (fabric, embroidery floss, needle). If you like to stitch with an embroidery hoop, bring one, but it's not necessary. Bits and Pieces -- how my passion for sewing a bazillion tiny bits of fabric together has kept me sane for decades, produced a lot of art and won me a free trip to Japan. 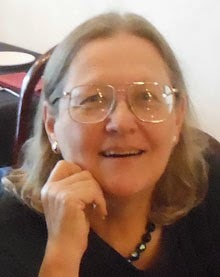 The Flag Junkie Makes Art -- although my quilts are primarily abstract, I have used the American flag as a recurring subject in my quilts and photography for many years; I'll talk about my affection for the flag and its meaning in my work. Daily Art is Good for You! -- for 18 of the last 19 years I've been doing daily art in various different mediums and techniques including hand-stitching, collage, quilting, photography, drawing, calligraphy and mail art; I'll tell you about my projects and why I think the discipline and format of daily art is great for anybody who wants to improve artistic skills and sensibilities.